The World Press Photo Festival 2018 is now over. Thanks to all who participated! *Please note, the program's content and timings are subject to change. Download the festival site map. Two-time World Press Photo contest winner Carla Kogelman will present her 2018 nominated long-term project, 'Ich bin waldviertel' along with her series 'Pool' and 'Past Delight'. In her work, Carla captures the daily life of people, especially children. Being around the same people for a long time, she becomes invisible, allowing her insight into the lives of her subjects and reaching the real story behind what is observed superficially. Writer and director Helene Klodawsky, photographer Rita Leistner, and Janet Haydock - the film's protagonist - will share the stories behind their collaboration in the making of 'From Janet with Love', nominated in the Innovative Storytelling category of the 2018 Digital Storytelling Contest. In 'From Janet with Love', the daughter of a Filipino pen-pal bride explores her mother’s life as an immigrant care worker and DIY philanthropist. Documentary filmmaker Matan Rochlitz presents 'I Have a Message for You', nominated in the Long Form category of this year's Digital Storytelling Contest. On the morning of April 4th, 1943, a young woman finds herself on a train. 'I Have a Message for You' is the story of how a decision she made that day saved her life but left her with a huge burden on her conscience. But in an almost unimaginable twist of fate, the final chapter to this story was to be written only 20 years later, by a chance encounter with a stranger. Luis Liwanag, freelance video and photojournalist and co-director of 2018 Digital Storytelling Contest nominated production, ‘Duterte’s Hell’ (Short form category), will present the film along with the work by other photographers from The Philippines. The presentation will be followed by a discussion about the photographers covering the Philippines' 'war on drugs' with Eloisa Lopez (see below). Eloisa Lopez, correspondent for Manila-based news outlet, Rappler, and a freelance photographer and journalist covers crime, human rights, and women and children issues. Eloisa will present her current work on children affected by The Philippines' 'war on drugs', as well as talking about the group of photographers covering the story, dubbed 'the nightcrawlers' by some publications, followed by a panel discussion with Luis Liwanag (see above). Photojournalist and videographer Francesco Pistilli will present images from his 2018 Photo Contest nominated series, 'Lives in Limbo', followed by a discussion about the refugee crisis along with Francesca Trianni and David Kofahl (see below). 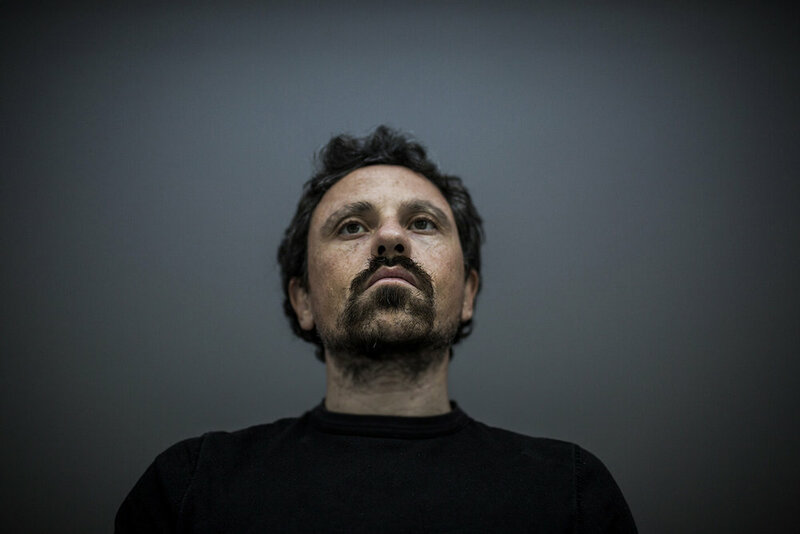 TIME video journalist Francesca Trianni and senior engineer David Kofahl present 'Finding Home', nominated in the Innovative Storytelling category of the 2018 Digital Storytelling Contest, followed by a discussion about the refugee crisis along with Francesco Pistilli (see above). 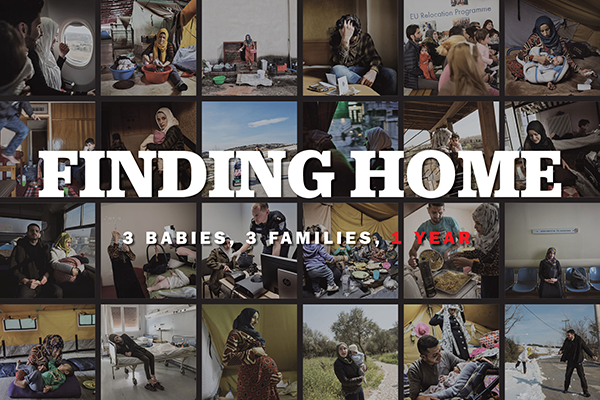 In 2016, TIME began telling the story of newborn baby Heln and her family, who are Syrian refugees seeking asylum in Europe. In this powerful interactive, Heln's mother Taimaa tells of the frustrations of waiting for asylum, the quiet moments of new motherhood, and the lonely struggle to fit in in a new land, through a series of text messages with Francesca Trianni. Patrick Brown will present 'Rohingya Crisis', nominated for both Photo of the Year and in the General News singles category in the 2018 World Press Photo Contest. His presentation will be followed by a discussion with other visual storytellers who have covered the crisis. Stephen McCarthy will talk about photographing Gaelic games, including his 2018 Photo Contest nominated image, 'Steaming Scrum', gaelic football and hurling. Erik Sampers will present his 2018 Photo Contest nominated work, 'Marathon des Sables', as well as a project about the lives of two Chinese men - Haixia Jia who has lost his vision, and Jia Wenqi his arm - who have dedicated their lives to transforming an island that was once pebbled wasteland into a green paradise, working together to grow trees. Oliver Scarff will present his 2018 Photo Contest nominated work, 'Royal Shrovetide Football' along side his other images of this historic annual event taken in previous years. He will also discuss his transition as a photographer working on purely news coverage, to incorporating sports photography into his remit, and the steep learning curve he encountered when he began covering major sporting events. In 2012, photographer Alain Schroeder sold his shares in his photo agency along with his house, packed his bags and embarked on a trip around the world shooting stories that interest him. Alain will present two of these stories, including ‘Kid Jockeys’, his 2018 Photo Contest nominated work, and ‘Kushti’, a series about a traditional form of Indian wrestling practiced in Akhara. 'Visages Villages' is a documentary road movie by and about director Agnès Varda and photographer/muralist J.R. as they journey through rural France and form an unlikely friendship. Directed by Agnès Varda and JR. Duration: 90 minutes. French with English subtitles. Ticket holders are invited to attend a special selection of films at Het Ketelhuis during the World Press Photo Festival. Please note, spaces are limited and attendance at the screenings is on a first-come-first-served basis. 'Visages Villages' will be screened again on Saturday 14 April at 21:00. Richard Tsong-Taatarii will present his 2018 Photo Contest nominated image 'Not my Verdict' in the context of the Black Lives Matter movement in Minnesota. Through his documentary photography work, Tsong-Taatarii has been bringing attention to the joys and tribulations of Minnesotans as a staff photographer for the Minneapolis Star Tribune newspaper for the past 18 years. Alessio Mamo will present his 2018 Photo Contest nominated photography, 'Manal, War Portraits', along with other work on this theme. In 2008, Alessio began his career in photojournalism focusing on contemporary social, political and economic issues. He extensively covers issues related to refugee displacement and migration starting in Sicily, and extending most recently to the Middle East. Espen Rasmussen will present his 2018 Photo Contest nominated series, 'White Rage - USA', along side his one-year project 'White Rage - Europe' on the rise of the far right movements in 16 European countries. Ivor Prickett will discuss his series 'The Battle For Mosul', nominated for both Photo of the Year and in the General News stories category in the 2018 World Press Photo Contest. Ryan Kelly presents his 2018 Photo Contest nominated work, 'Car Attack' (Spot News category) discussing the lead up to the Charlottesville attack, and his experience covering the story. Eliot Higgins is the founder of Bellingcat, an organization which specializes in the application of open source investigation techniques to a range of topics, from corruption to conflict, known most famously for its work on the downing of MH17 in Ukraine in 2014, and the conflict in Syria. 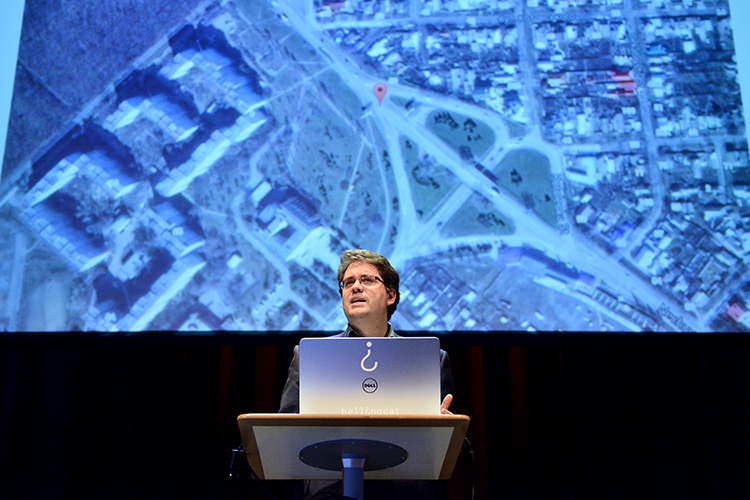 In his featured presentation, Eliot will examine the methods used by Bellingcat to verify images, and how that allows the team to investigate a range of incidents, from Russian bombing campaigns to tracking down missing persons. David Becker will present his 2018 Photo Contest nominated work, 'Massacre in Las Vegas', his series covering the massacre at the Route 91 Harvest Country Music Festival in Las Vegas in October 2017, followed by a discussion on the same topic with producer, Malachy Browne (see below). 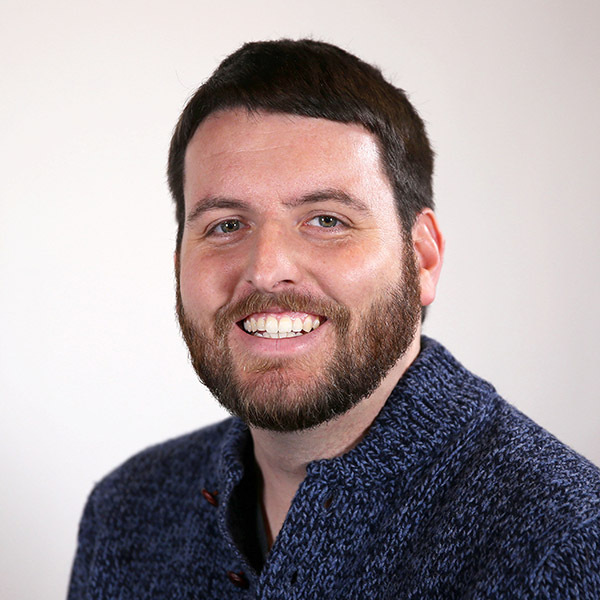 Senior story producer at The New York Times Malachy Browne will present '10 Minutes. 12 Gunfire Bursts. 30 Videos. Mapping the Las Vegas Massacre', nominated in the Long Form category in this year's Digital Storytelling Contest. Malachy will talk about the innovative reporting techniques employed to create the most complete picture to date of the worst mass shooting in modern American history, followed by a discussion on the subject with photographer David Becker (see above). Pete Souza was the Chief Official White House Photographer for President Obama and the Director of the White House Photo Office. For his featured presentation, Pete Souza will elaborate on his time at the White House next to the president, capturing it all—nearly 2 million photographs in total. His recently published Obama: An Intimate Portrait will serve as the basis for the presentation, sharing with the audience the poignant behind-the-scenes stories that accompany the photographs. Pete Souza will be signing copies of Obama: An Intimate Portrait at the festival's PhotoQ Bookshop after his presentation. This is the exclusive opening of the World Press Photo Exhibition 2018 in De Nieuwe Kerk in Amsterdam, hosted by Canon. The flagship World Press Photo Exhibition 2018, displaying prize-winners’ work from the photo and digital storytelling contests, along with the winner of the FotoEvidence Book Award with World Press Photo, premieres at De Nieuwe Kerk during the festival before starting its world tour. Two-day and Friday wristbands grant access to the Canon Opening Night, giving festival ticket holders the chance to be among the very first to discover the exhibition. 'Control' is a profile of Ian Curtis, Joy Division's mysterious singer whose personal, professional and romantic problems lead to his suicide at the age of 23. Directed by Anton Corbijn. Duration: 119 minutes. English. Together with Féminin Pluriel Amsterdam and the International Women’s Media Foundation, the World Press Photo Foundation will host an informal get together for women, providing an opportunity to strengthen networks and exchange thoughts and experiences across professional communities. The event will begin with a Q&A with female award nominees from the World Press Photo 2018 contests, and the IWMF Anja Niedringhaus Courage In Photojournalism Award. This event has limited capacity, and has been fully booked. Giulio Di Sturco presents his 2018 Photo Contest nominated work, 'More Than A Woman', along with another series of his work, 'Sophia'. Much of Di Sturco's personal work focuses on human adversity in climates of environmental and technological evolution. The Washington Post's Seth Blanchard, Arelis Hernández and Whitney Leaming, members of the team behind 2018 Digital Storytelling Contest nominated production, 'Sin Luz: Life Without Power' (Immersive Storytelling category) will present their work in Puerto Rico. 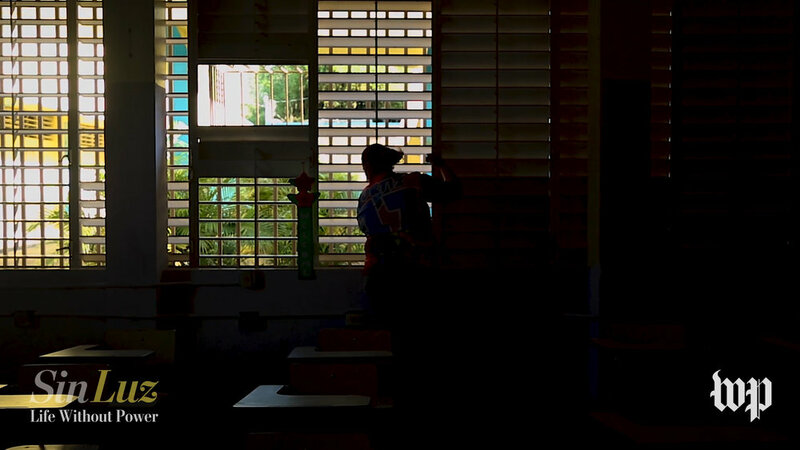 'Sin Luz: Life without Power' is an immersive video interactive that tells the story of Puerto Rico’s apagón, or “super blackout,” the longest and largest major power outage in modern U.S. history. Visual storyteller Sheng-Wen Lo will present his 2018 Digital Storytelling Contest nominated production, ‘The March of the Great White Bear’. The short film is part of his project ‘White Bear’, which explores the dilemma concerning captive animal programs by focusing on polar bears on display worldwide. Ronaldo Schemidt will present his work, 'Venezuela Crisis', nominated both in the Photo of the Year and Spot News singles categories, followed by a panel discussion on the current situation in Venezuela with Juan Barreto (see below). Juan Barreto will present his 2018 Photo Contest nominated story, 'Demonstrator Catches Fire' (Spot News stories) followed by a panel discussion on the current situation in Venezuela with Ronaldo Schemidt (see above). Kadir van Lohuizen will present his 2018 Photo Contest nominated work, 'Wasteland' (Environment category) in which he explores how six mega cities manage, or mismanage, their waste. Be among the first to visit the World Press Photo Exhibition 2018 in Amsterdam’s historic De Nieuwe Kerk. Hear about the stories behind the award-winning images in an exclusive guided tour by a World Press Photo curator. Please note there is a maximum capacity of 30 people. Spaces will be allocated on a first-come-first-served basis. You can register for the tour at the registration desk in De Nieuwe Kerk on the morning of the tour. The guided tour is only available to people with a two-day or Saturday one-day festival pass. Magnum's director of special projects, Francesca Sears, will present Magnum Chronicles, a newspaper series which provides a new vehicle for exploring key issues of our modern times, giving Magnum and its photographers a way to elevate their voice and experience as long standing chronicles of the world within the realm of wider public debates. Each newspaper will be curated by a different Magnum photographer. Peter van Agtmael, the curator of the first edition in the series, will discuss the content of ‘A Brief Visual History in the Time of ISIS’ which includes an essay and timeline by Peter Harling. Photographers Tanya Habjouqa (NOOR) and Omar Imam will also present their work, focusing on innovative ways to tell stories from the Middle East. Five-time World Press Photo contest award winner, Ami Vitale presents 'Finding Stories that Connect Us'. She will speak about her work covering the conflict in Kashmir, as well as her latest World Press Photo award-winning series, 'Pandas Gone Wild' and this year's nominated story, 'Warriors Who Once Feared Elephants Now Protect Them'. Luca Locatelli will present his 2018 Photo Contest nominated series, 'Hunger Solutions' (Environment, stories category). Luca's work focuses on stories that document how people, science, and technology impact and change the world around us. He is currently working on stories about energy production and climate change, solutions for famine, sustainable innovation in cities and altered landscapes as consequences of our actions. 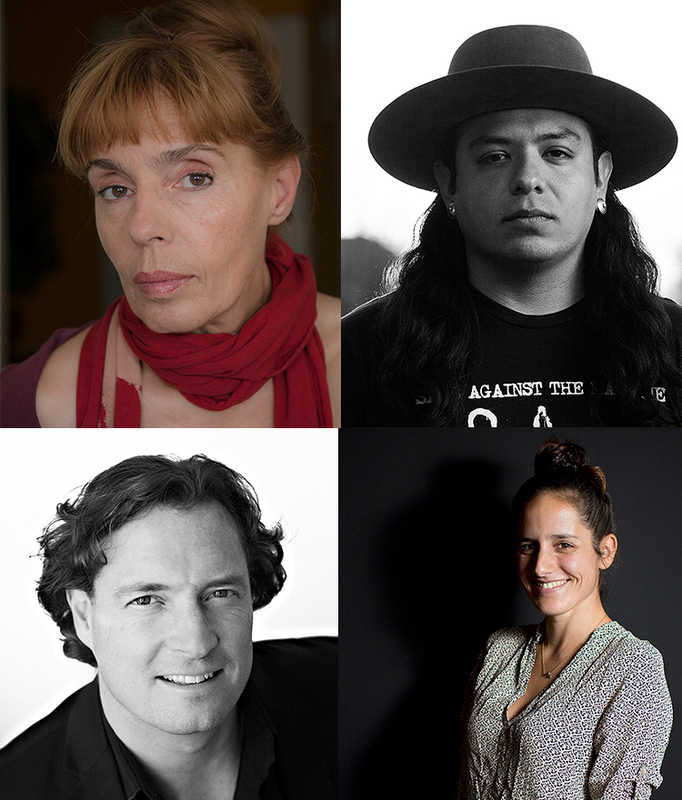 Svetlana Bachevanova, founder and publisher of FotoEvidence Press, will present 'Standing Strong' on behalf of Josué Rivas, the winner of the 2018 FotoEvidence Book Award with World Press Photo. The book departs from classic reportage, as Rivas seeks to evoke a spiritual awakening he experienced photographing the resistance to the Dakota Access pipeline at Standing Rock. Danielle Villasana, 2018 Book Award finalist, will present her project, 'A Light Inside'. She will discuss the issues of ethics and trust she faced creating her intimate reflection on the life of trans women in Peru and the role of photojournalists in activism. Marcus Bleasdale, 2015 FotoEvidence Book Award winner and a documentary photographer who uses his work to influence policy makers around the world will present his award-winning project, 'The Unravelling: Central African Republic', and discuss the role of photojournalists in documenting human rights violations to contribute to accountability for those who commit atrocities. After the presentation Marcus Bleasdale will sign his book at the PhotoQ Book Shop. 2018 Photo Contest nominee Jasper Doest will share his series ‘Sacred No More’, and the story behind this work, which questions our relationship with wild animals. After revisiting a specific troop of Japanese macaques for over 11 years, Jasper started to zoom out and see the challenges humans and macaques face, living together in modern day society. Four-time 2018 Photo Contest nominee and two-time previous winner, Thomas P. Peschak will present his work revealing the fragile lives of marine iguanas, giant tortoises, penguins and albatrosses, and shine a light on the horrific realities of “zombie” mice and vampire finches. Thomas uses science and photography as partners in crime to weave conservation narratives to make a measurable difference. 'Instant Dreams' tells the story of a group of scientists who are trying to unravel the chemical formula of Polaroid and the Polaroid-users that eagerly await its rebirth. Each in their own way tries to keeps their instant dream alive. Directed by Willem Baptist. Duration: 90 minutes. Dutch with English subtitles. ROAR! Safety will hold a workshop designed for female photographers covering personal safety, situational awareness, pre-assignment planning, sexual violence - its affect on us and how to support others, self defense and more. The session will be held by Alison Baskerville, a freelance photographer and qualified hostile environment and safety adviser. Adam Ferguson presents his 2018 Photo Contest nominated work 'Boko Haram Strapped Suicide Bombs to Them. Somehow These Teenage Girls Survived'. Anna Boyiazis presents her 2018 Photo Contest nominated work, 'Finding Freedom in the Water', a story about the Panje Project (panje translates as ‘big fish’), which provides opportunities for women and girls in northern Zanzibar to learn swimming skills in full-length swimsuits, so that they can enter the water without compromising their cultural or religious beliefs. Anna's areas of focus include human rights, public health, and women's issues. Through her work she aims to elicit compassion and bring our shared humanity to the fore. Heba Khamis will present her nominated work, 'Banned Beauty', a series which looks at the traditional practice in Cameroon of breast ironing which is carried out by families in the belief that it will delay maturity and help prevent sexual violence against girls. Khamis is an Egyptian storyteller whose work concentrates on social issues that are sometimes ignored. Photographers Maheder Haileselassie (Centre for Photography Ethiopia) and Angela Jimu (Zimbabwean Association of Female Photographers) present their work and their inspiring journeys towards building local capacity and offering visual journalism education in their respective countries. 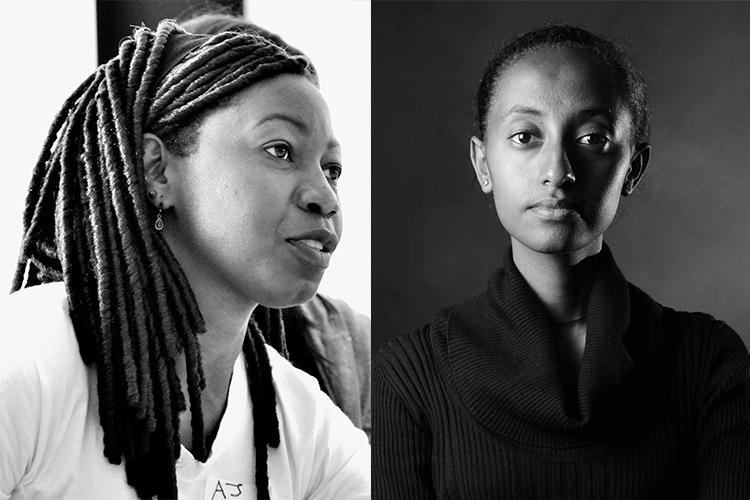 A panel discussion will follow, in which Maheder and Angela will discuss their motivations, challenges and successes as well as potential concrete solutions to better educate, promote and elevate the voices of young emerging talents in Ethiopia and Zimbabwe. Stephanie Sinclair, a World Press Photo and Pulitzer Prize-winning journalist, is known for gaining unique access to the most sensitive gender and human rights issues around the world. Through her work, Stephanie portrays the lives of vulnerable girls subjected to practices such as child marriage, genital mutilation and acid attacks. Stephanie will present this year's Sem Presser Lecture on her ongoing 15-year series, “Too Young to Wed”. Festival two-day and Saturday ticket holders are invited to attend IWMF's Anja Niedringhaus Courage In Photojournalism Awards ceremony. The Awards recognize three journalists whose work, like Niedringhaus's, inspires action and helps us better understand the world. Join us for this special event taking place at Westergastheater on the evening of Saturday 14 April. Be among the first to see our brand new exhibition featuring images from the 2018 Photo Contest and 2018 Digital Storytelling Contest winners. Two-day and Friday ticket holders are invited to attend the exclusive Canon Opening Night on Friday 13 April from 20:00. All ticket holders can visit the exhibition on Saturday and Sunday 10.00 - 18.00 daily. During the festival ticket holders are invited to visit the museum and discover work by Seydou Keïta, Jacob Riis (until 13 April) and Tereza Zelenkova. Open Friday 10:00 - 21:00 and Saturday and Sunday 10:00 - 18:00. Ticket holders are invited to attend a special selection of films at Het Ketelhuis during the World Press Photo Festival, screened daily on Friday and Saturday at 13:00 and 21:00. See the program for more details. Please note, spaces are limited and attendance at the screenings is on a first-come-first-served basis. Your festival wristband will grant you entry to Huis Marseille's current exhibition; Bernd, Hilla and the Others / Photography from Dusseldorf from Friday 13 to Sunday 15 April, 11:00 - 18:00. Sessions will take place at the PhotoQ Book Shop in the Machinegebouw after the respective photographer's presentation. 13:00: Patrick Brown will be signing copies of his book Trading to Extinction. 18:15: Pete Souza will be signing copies of this book, Obama: An Intimate Portrait. 11:10: Kadir van Lohuizen will be signing copies of two of his books; Where Will We Go? and Via Panam. Peter van Agtmael will be signing copies of two of his books; Disco Night 9/11 and Buzzing at the Sill. Marcus Bleasdale will be signing copies of his book, The Unravelling: Central African Republic.